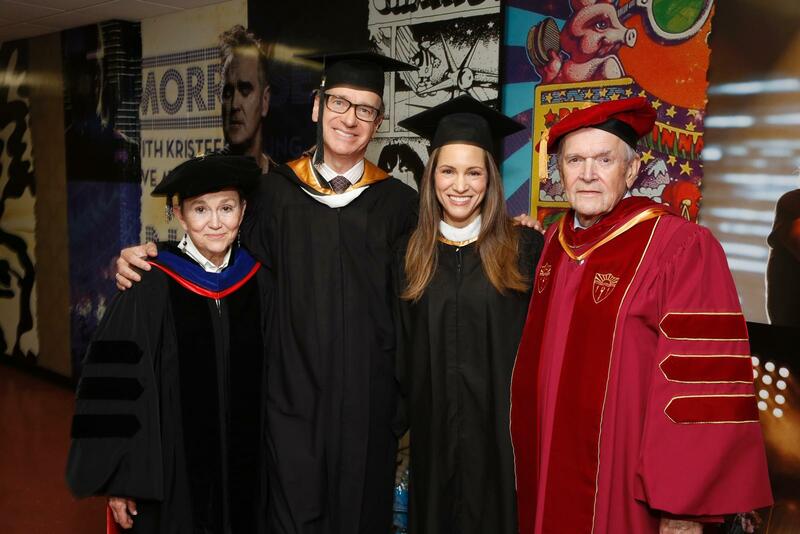 The School of Cinematic Arts held its commencement at Los Angeles’ Shrine Auditorium on Friday, the 13th of May. The keynote speaker of the day was SCA alumnus Paul Feig, the award-winning comedy writer/director/producer known for groundbreaking work like the TV show Freaks and Geeks and the movies Bridesmaids and The Heat. Feig was joined by producer Susan Downey, the 2016 recipient of the Mary Pickford Alumni Award, which is awarded to an alumnus who has brought distinction to SCA. Downey is the producer of the Sherlock Holmes franchise, the third installment of which was just recently announced, as well as Iron Man 2 among other successful films. Having the opportunity to hear from successful industry professionals who not too long ago were sitting in the same seats as this year’s graduates is certainly among the most anticipated traditions of any commencement ceremony. And Feig, known for a trademark humor that values the eccentric and unexpected, was expected deliver a memorable speech. Even for a veteran comedy writer like Feig, however, the responsibility of delivering a killer commencement speech can be a lot of pressure, particularly in a viral era. Delivering a graduation speech that could land on a list of 2016’s best was likely not Feig’s top priority. Nevertheless, he did exactly that, producing a list of rules for success that had a memorable first entry: Don’t Be An A**hole. Rule Number One set the tone for a list that was characterized by the kind of insight and honesty Feig’s fans have come to expect from his prolific comedy mind (See the full list below). 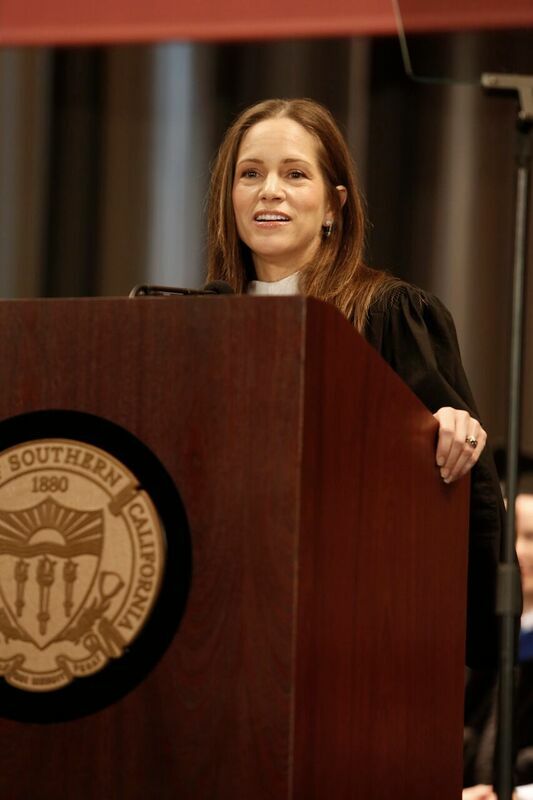 Like Feig, Mary Pickford Alumni Award recipient Susan Downey also preached the value of hard work and persistence. “I know two things about myself,” she told the audience. “For as long as I can remember, I’ve loved movies, and I’ve worked hard.” She reflected on all the experiences—good and bad—she had while her way up from PA to Assistant to, now, producer for some the top franchises in the world—including being charged with keeping an eye on “a very talented, but ‘high-risk’ actor.” That was how she met her husband Robert Downey Jr., her partner in their production company, Team Downey. “And remember that the most important people in your professional lives in the decades to come have lived through the past few years with you and are sitting beside you today,” she added. The School of Cinematic Arts graduated almost 500 students this year—and one dog: Kona. The service dog of Film & Television Production division graduate Patrick Ivison received a special commendation for having attended all the classes needed to quality for a degree. It’s a rule familiar to anyone who has worked in entertainment, and one that laid the groundwork for Feig’s remaining __ pieces of advice to graduating students. People work jobs, they have lives, they have kids—we’re their time off,” Feig said of working in entertainment. “We are their comfort food. We are their vacation... If they like something, that’s their prerogative. And it’s up to us to figure out how to make something they like that can entertain them and then, if we can, sneak all the other stuff in and teach them something or make them feel something or show them something they haven’t seen. “Sometimes I see things that are so devoid of humor,” said Feig. “You can sell a lot more—and I don’t mean tickets; you can sell them ideas and all that—by making them laugh,” he suggested, letting his comedy bias shine through.